Visit the highest observatory in the western hemisphere: The One World Observatory! The lift to the top takes less than sixty seconds! Once there you will enjoy an amazing view of the New York skyline. Pre-book one of the most popular tickets in town and avoid the queues to the Observatory deck! In May 2015 the One World Observatory Deck opened on the 100th and 102nd Floors of the One World Trade Center, making it the highest observation deck, on the highest building, in the Western Hemisphere. The tower is also known as the Freedom Tower, built on the site where iconic World Trade Center stood until the tragic events on the 11th of September 2001. When you first enter a large video board in the Global Welcome Center offers greetings in an array of languages and a dynamically generated world map highlights the hometowns of visitors. A program called 'Voices' tells the personal stories of the men and women that built the One World Trade Center and you also get a close-up view of the bedrock on which the building stands. Once you have finished in the Welcome Center you proceed to one of the dedicated lifts that will take you up to the 102nd floor in under 60 seconds. At the top, you'll experience a virtual time-lapse that recreates the development of the New York City's skyline from the 1500s to the present day, followed by a two minute video presentation that combines bird´s eye imagery, time-lapse shotswith abstract textures and patterns to give the viewer an idea of the unique pulse of New York City in three dimensions. On the 100th floor of the Observatory, also known as the Discovery Level, you´ll be able to enjoy an expansive 306 degree view over the city, taking in the horizon, the iconic buildings and the surrounding waters. Once you complete your booking online we need to process your personal tickets manually, so it may take up to 48 hours for you to receive the final e-ticket by e-mail. You then simply print the e-ticket and bring it with you to the One World Observatory in New York. 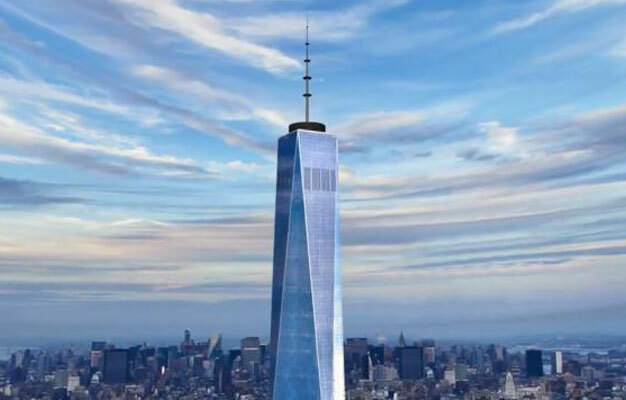 You simply select your prefered date and time of visit and be sure to arrive at the One World Observatory at least 15 minutes before your selected time. The tickets are only valid for the date and time you select at the time of booking. No, but children under the age of 6 are free when accompanied by a paying adult. - Please note you have to proceed through security checks to access the One World Observatory, so please do not bring large backpacks or luggage. - Our e-tickets do not allow you to jump any queues any the security check and at the elevators going up and down from the observatory deck, only the entrance to the tower.